I have a double sided printer so always do my own, but I would certainly go for a properly printed & bound (even if just spiral). Hell - I couod always just head down to the local Kinkos and get one that way. There was such an idea once, but finally no print service was found which could print them for a reasonable price in small quantities. Well when I bought my copy of the SDCS, it only came with two versions, 1.1 and 2.3. 3.2D didn't come out until the RTime-8 was released. That's why there is no mention of 3.2 in the original SDCS manual and there is an addendum in the RTime8 manual that describes the new 3.2 features. Maybe they reissued the construction set with 3.2 included, but the original construction set did not have 3.2 in it. Alright, that makes sense. I'd wondered myself why it wasn't mentioned in the SDCS manual. They probably did update the SDCS disk later but not the manual. Good historical information. I bought the SDCS from ICD Europe in the late 1980's. It contained all SD disk versions from 1.1 to 3.2d. It came with the 1985 guide for 1.1 and 2.3 as the manual, and as "manual add on" the RTime8 Supplement which contained the latest developments for 3.2. An easy way to "update". More good information. So they just included the R-Time 8 Supplement manual with the construction set, later, in order to the cover all versions of SpartaDOS on the disks, even though an R-Time 8 cartridge wasn't (necessarily) being purchased. Kind of an odd arrangement, but whatever worked for them. I did already have both manuals listed together under the same entry on my website -- with all three ATR's you sent me before, GB. I wasn't sure they came together as a package, but I assumed it was probably so based on what versions were included on the disks and what material was covered on the two manuals. Edited by MrFish, Fri Sep 30, 2016 9:10 AM. There are also two versions (That I know of) of the SDX manual, a pink/red cover and a purple/blue cover. This is the same version, at least what I bought from ICD Europe. The paperback itself is more in a dusky pink whereas the cardboard wrap of the sales package was printed in purple/blue. The manual itself is V. 4.19, most likely the last printed version. To complete it to V. 4.20 a few pages printed on red paper were included covering the changes/add-ons. A few years ago I re-worked it into a complete manual available under legacy versions at the homepage of the SDX Upgrade Project. I have never seen the manuals issued with the early versions 4.17 and 4.18 or later revisions from FTe. V4.19 was the first version of the SpartaDOS X cartridge. this thread is about the of the early disc based versions SpartaDOS. ... this thread is about the of the early disc based versions SpartaDOS. ehm, no - looking at the title of this thread it is about early versions of SpartaDOS. And SDX 4.19 is an early version looking at the current issue. I was just looking into this yesterday and last night. I don't know if kheller2 is speaking from direct knowledge or going from pictures similar to this: Fibrewire ICD Lot I thought this showed two different versions of SDX at first, but when you examine the pictures closely -- especially the last one -- you can see that the purple cover item is the box/packaging and the dark pink item is a manual. So I assumed -- as GBXL has stated above -- that they came together from one copy/version of SDX. My initial post was asking about early disk versions of SpartaDOS, but they're all part of the same family of products and I'm interested in any commercial materials and related tools that have yet to be archived. Edited by MrFish, Sat Oct 1, 2016 6:05 AM. You all might be right that I mistook there being two version of the SDX manual.. But I swear I sold one that was different. The only one I have left is the Purple boxed, Pink book dated 89. "First version"? 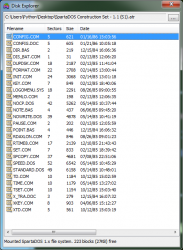 Then what are these v4.17 and v4.18 roms that are floating around the net? It may be the earliest version of SpartaDOS X, but SpartaDOS X is a later version of SpartaDOS. The original post asked about whether early(1984) versions of the SpartaDOS manual/ATRs were available. My memory might be wrong as well, but I would have said there was an earlier version of the SDX manual, not the black/pink one. I went looking for mine but wasn't able to find it. I know when Mike H. came visiting all the SDX manuals he gave me were the black/pink ones. As for the SDX ROMs, I don't know the history there but the 4.17 was the first one out I guess just in the US. In Canada the first one we got was the 4.19, and about a month later came the offer to mail your 4.19 back to ICD to get a free upgrade to 4.20. I think I sent one of my 4.19's back and kept the other one. I don't recall now when 4.21 was released. In Canada the first one we got was the 4.19, and about a month later came the offer to mail your 4.19 back to ICD to get a free upgrade to 4.20. I think I sent one of my 4.19's back and kept the other one. And did you receive the red "Addendum Pages" with it? I don't recall now when 4.21 was released. From SD 1.1 I have never seen original packages though I browsed many flea markets and computer events for A8 collection purposes during our years in the US. Do you still have scans of the original pages that came with v4.20? The scanned manual that I have shows copyright dates of 1987, 1988, & 1989. If it's that rare, I wonder why Atarimania only lists it as rarity 7, which is for a boxed copy as well. Maybe you're going by the stamp on the front of the manual, which is 12-88. But even inside the version that you worked on, the copyright dates are 1987, 1988, & 1989. Edited by MrFish, Sun Oct 2, 2016 6:45 AM. Yes, of course I kept a full scan. The stamped serial number is 059442. Yes, that is noted on the respective pre-page and most likely covers the product development as a whole. The question however is, how many versions of the manual do exist. On what those "rarity estimations" are based is not clear to me. The first original version of SD(CS) I acquired was SDCS 3.2d and my hunt for earlier versions wasn't successful. - Were the printed manuals for V. 4,17 and 4.18? - Were there updates in form of "red sheets" for V. 4.21? - What was the real outcome of FTe's work done for V. 4.22 and is it documented somewhere? Edited by GoodByteXL, Sun Oct 2, 2016 7:18 AM. Would you mind sharing them? It would be nice to include these extra pages on my website. On what those "rarity estimations" are based is not clear to me. Well, they're somewhat subjective to be sure. Who knows, maybe someone over there (at Atarimania) has 5 copies laying around. Edited by MrFish, Sun Oct 2, 2016 7:32 AM. No, I've never seen any addendum sheets, not even with the manuals Mike dropped off. Atarimania's estimations on utilities are not very accurate. They are much more difficult to qualify than games and widely available apps. I agree that SpartaDOS earlier than SDCS is pretty rare. Were there ever disk images and manual scans made for the early versions of SpartaDOS? I have what physically appears to be the exact same disk as Atarimania and it is 1.1 HS. I'd be interested in an image if it differs in contents from the 1.1 HS that comes with SDCS. The SD 1.1HS from the SDCS 3.2 isn't the early version. 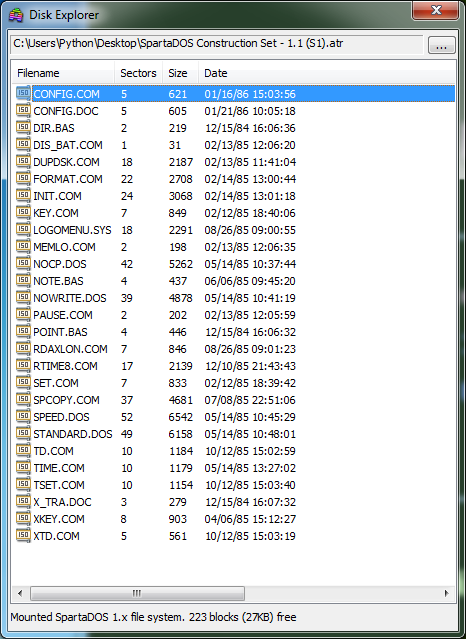 A pic of the early version's disk directory is here. Very interesting early ICD add! Many thanks for the pointer. But I wouldn't rely on an add to be 100% authoritative. Actually, it is very possible that the directory seen was intentionally created to fit the screen. What I found extremely interesting though, is the bottom part of the add with the Archiver products. That the first time ever I see the Archiver products mentioned under the ICD brand. I always seen them under the Spartan brand, and later as CSS products. I wonder if ICD really sold them. If they did, they must be pretty rate. I've never seen any Archiver software ICD branded. Not even non-original copies.